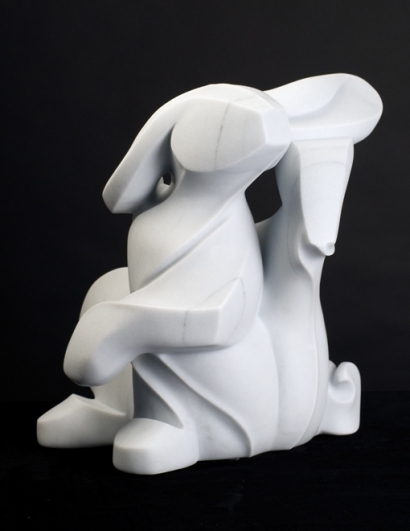 “Spiral Bunny” was my first large stone sculpture, started at my first Marble/marble Symposium in 2006.I finally completed this piece the following January. I had so many adventures and learned so much through the making of this sculpture. For that reason alone it will always be one of my most favorite pieces. After the symposium ended, I continued work on the Bunny in my home workshop attached to the garage in our first home in Loveland. New neighbors moved in next door who were very sensitive to noise. I was compelled to move my carving to a friend’s backyard in Berthoud, a small town 5 miles from Loveland. This was in August, and I worked in her backyard unbothered. Snow fell in October that year–two snowstorms actually! I wore 3 layers of clothing, carved in the snow, and finally finished the carving on November 1. I moved production back to the warmth of my garage studio for filing and sanding. The following August I proudly exhibited Spiral Bunny at my first Sculpture in the Park show. The piece sold to a wonderful art connoisseur who has remained my friend and patron ever since.